As Russia, the EU, and the U.S. cross back-and-forth about economic sanctions, tensions between Russia and the rest of the world are mounting. But Russia's Deputy Prime Minister Dmitry Rogozin threw some major shade Wednesday when he Rogozin tweeted a photo mocking President Obama — by pitting the president with a small dog against President Vladimir Putin's leopard. Oof. 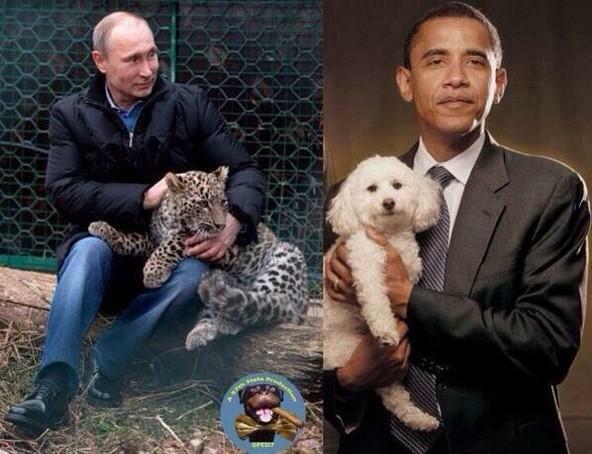 The photo, which stitches together a photo of Putin cuddling a leopard and Obama holding a fluffy white dog (not his Portuguese water dogs, Bo and Sunny, though), was tweeted with a pretty frank message: "We have different values and allies." The photo came just days after the U.S. and EU imposed more sanctions on Russia in an attempt to stop the country's support of pro-Russian separatists actively fighting the Ukrainian government. It was an obvious slight against Obama's masculinity, a trait that the bare-chested-horse-back-riding, polar-bear-caressing Putin has proved, time and time again, that he has in droves (but, let's be real, that polar bear was dead asleep). Putin takes apparent pride in his image as the rugged Soviet, keeping a very public record of his various conquests through the deep sea and down into volcanoes. Between all of his manly-man adventures, it's a wonder that Putin has time to run a country! I honestly just can't get this fantastic image of Putin and Rogozin putting their heads together, giggling like middle school girls at a sleepover over a bootleg version of Photoshop while putting this together. Meanwhile, sanctions threaten to damage financial and energy sectors of the country in a devastating way. But hey, we can spare a few moments for some photo editing fun.